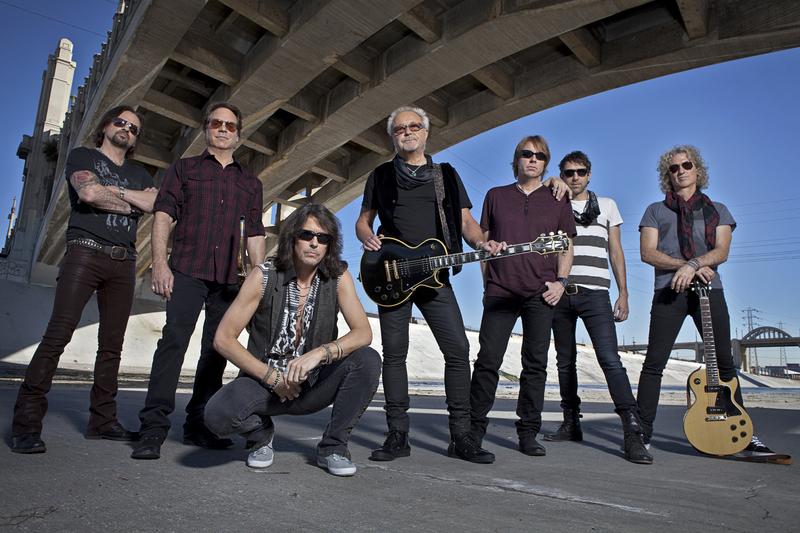 I recently had the pleasure of interviewing the lead singer of Foreigner, Kelly Hansen. Foreigner is currently on the road with Don Felder and Styx on the The Soundtrack of Summer Tour and they released a companion album, The Soundtrack of Summer: The Very Best of Foreigner & Styx, featuring a new version of “Hotel California” that’s performed by Felder, Styx and Foreigner. Enjoy the interview and make sure to catch the guys when they come to your area this summer. Almost 10 years ago Mick Jones asked you to be the new lead singer of Foreigner. How did you two meet? I had been changing my career direction – I wasn’t happy with what I was doing. I was doing producing, engineering and artist development. All of a sudden I had a revelation: “I’m not doing what I do best, which is singing.” And I felt that I need to be proactive about finding something to do. I saw an article on the internet about a charity show that Mick had done in Santa Barbara, California, a couple hours north of me. And the article made me think, “Is he doing a solo project?” I knew Lou wasn’t in the band but I didn’t know or understand what was going on with Foreigner at the time. But I had been around a while. I made a couple calls, found out who their management was and talked to them. Over the course of a few weeks, I got the impression that they were starting to revamp the band and they were looking for a singer for Foreigner. It sounded really interesting to me. They sent me a CD with five of Foreigner’s biggest hits on it – the original recordings, but without vocals. And they said, “Put your voice on these,” and I did. Mick heard those in New York and they were coming out to LA to do some rehearsals so I wisely said, “Can I be the first guy in to jam with them?” So, I came down on a Saturday and that’s where I met Mick. A couple of the guys in the band I had known but that’s the first time I met Mick. How did it feel to step into this role and sing the iconic songs that Lou Gramm had become known for? They are great songs, and I think that’s what it’s about. Lou, of course, did a fantastic job of interpreting them and singing them on those albums. So, I knew I had to be good at what I was doing, and at some point I think you have to have enough confidence in yourself and say, “OK, I can do this.” And I had great support from Mick and the rest of the guys. They felt I could do it. It’s kind of just jumping in, and thankfully it turned out well. This summer Foreigner is touring with Styx and Don Felder. What brought all of you together for this exciting tour? Well, we’ve known Styx for a long time and we were looking to put together a package that was something we hadn’t done before. And I believe Don has the same management as Styx and Tommy Shaw, who played on Don’s latest record and wrote with him. It kinda came together that way. It seemed like a great combination. And when you think of all the great songs that are going to be at the show we said, “This sounds like the soundtrack of summer.” So, that’s where it was born. How was it going into the studio with Don, Tommy and the rest of the guys to create a new version of “Hotel California” for the Soundtrack of Summer album? It was so funny. We went up to record the song at Jeff Pilson’s studio – the bass player in Foreigner, of course. We were working on the track and I get into the booth to sing my verse of the song and (laughs) I get behind the microphone and I look up and there’s Don and Tommy and I’m like, “Oh, OK. Great, I get to sing this verse in front of Tommy and Don.” (laughs) It was great. They loved it. I think it sounded great and then Tommy came in on it. He sang his verse. So, it was this collaborative kind of thing. It was like, “OK, you’re going to sing this part. We’ll do the harmonies this way.” And it really came together very quickly, and it was a little funny to be in front of those two and go (laughs), “OK. I’m going to sing in front of everybody today.” But it worked out great. The 2008 Foreigner compilation, No End In Sight, featured “Too Late,” the band’s first new song since 1994. What was it like going into the studio to record this song with guys? I was very happy to be able to go in and record new material and, subsequently, we went in and did Can’t Slow Down, a whole album of new material, which I was able to co-write on. It was an important step for us to record new material so that people knew this lineup was good and valid and strong. I think all of the songs really show that. Can’t Slow Down was well received by fans and critics alike. How did it make you feel to see it get such a warm reception? It’s difficult because when you have a band like this that’s sold millions and millions of copies of individual records, you’d like to get to that place again. But I don’t think that’s how the business is now. I mean, a lot of times when you hear the phrase “records sold” nowadays you’re talking about single-song downloads. It’s not full albums or CDs anymore. But the fact that we had such a great response…we already felt good about the album and the material. So, the reality is that if you’re doing it right, I feel you’re doing an album for you. You’re making music that’s saying something you want to say and it sounds the way that you wanted it to sound, and then you hope everyone gets on the bandwagon with it. The praise we got from the critics and the fans really made me feel good – that people got it. And what was the songwriting process like for that album? It was mostly just me, Mick and our producer, Marti Frederiksen, who’s written a lot of songs for other people, as well as a couple co-writers that we had come in. It was really a hard-work process. We started that third quarter of 2008 and it went all the way through 2009, while we were on tour in the U.S. and in Europe, and we were doing a video. It was in August or September and we were in a hotel suite in Detroit finishing up – with a portable studio in the hotel room, recording last-minute vocals, background parts, and lead vocals. And then Marti was producing, so he’d have to take some time to fix some things or mix down a few parts, and I’d have to go out in the hallway. And I had to help with all of the editing of the video. I mean, 2009 almost killed me. The writing process, a lot of it was spent in a hotel suite in New York where Mick and Marti and I would go in and just crank out ideas every day. Flesh them out, put them into Pro Tools and say, “That one sounds really good. Let’s revisit it.” Or if we were really hot on something, keep working on it, keep rolling on it. So, the songs really started from the skeletal recording that we put into the computer on the road and in those hotel rooms, and from that we built them into the finished tracks. It’s not like we did a demo and later on went into the studio and completely re-recorded the song. It just evolved from the original takes. Are you guys planning a follow-up to that album? Well, we’re working on new material and how we’re going to present it is still undecided. I don’t know if, in this day and age, it make sense to put out a full album of new material all at one time. You end up putting a year of your life into it and lots of money, and then people will download one song. So, we’re thinking of how we’re going to present new material. But we’re working on stuff, and we have a couple of special projects for next year. Plus we’re doing an acoustic tour in Germany after the Soundtrack of Summer tour, and that may appear in the U.S. in some form too. You’ve said that Aretha Franklin, Ray Charles and Marvin Gaye are key musical influences. What about these three artists’s music had such a profound impact on you? The first thing is you have to take in your first absorption of hearing that material. And sometimes you’re hearing R&B or blues for the first time or for the first year you’ve ever heard it and it has a profound effect on you. You hear a lot of people talk about the first time they heard The Beatles. Now, it’s 50 years later and everyone’s heard The Beatles forever and it doesn’t have the same impact. But that first year, that goes into your brain and it becomes part of your consciousness and it becomes part of your influence. And you start incorporating that into who you are as a musician and then as a songwriter, and as a singer and as a performer. It’s kind of like osmosis. A plant takes in Sun and it grows into a whole new entity, which is this plant, and that’s kind of what it is when you hear music. You take it and absorb it through osmosis, and it comes out in some different kind of way. Prior to Foreigner, you were in a melodic hard rock group called Hurricane. What was that experience like? (laughs) Well, that experience was exactly what you’d think it was. We were kind of a pop/metal band in the late ’80s and early ’90s. It was a pretty wild time, and a pretty wild time leading up to it. We were young and we traveled on tour in vans and motorhomes, and there was a lot of craziness. There were great experiences. A lot of experience gained that definitely became important when I joined Foreigner, because I don’t know if you could jump into a band like Foreigner and be the lead vocalist and just tour the world without having some skills from some previous experience. So, that really helped me a lot. And I have very fond memories of those times, and also some very great disappointments. For example, we spent a year of our lives making that last Hurricane record and as soon as it was released, we’re on the road in the tour bus, and we hear that our record company just went bankrupt. And it was over. Then grunge came in and it wasn’t our time anymore. So, it was pretty wild. I would just like to say that I have always LOVEd Foreigner, Styx, and Jouney! My best friend is a even bigger Foreigner fan than I! As kids, she brought me to Foreigner and I brought her to Journey(with Steve Perry)! We will always be fans! The music brought us through a lot of good and bad times. It is great to see that these bands still live on. And mean so much to so many. Keep rockin’! I agree, Stacey all three bands rock. Although, I’ve never seen Steve Perry live. Hopefully I’ll get the chance someday soon.